Experience – Viviane's Cleaning & Restoration Inc provides pressure washing services to clean your driveway, deck, sidewalk or patio. 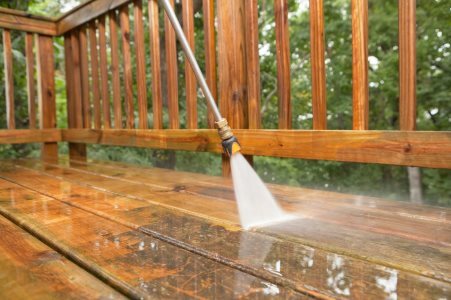 Our power washing technicians have the experience and tools necessary to thoroughly clean the exterior of your home by applying high pressured water to remove dirt, debris and mildew from hard surface areas. They use no toxic chemicals for the safety of your family, pets and lawn. If your driveway is dull or stained, Viviane's Cleaning & Restoration Inc can provide pressure washing services to thoroughly clean it. Pressure washing can remove dust, dirt, grease, and many other types of build up from stone, brick, concrete, wood and aluminum siding. Affordable Pricing – Viviane's Cleaning & Restoration Inc offers premium pressure washing services at fair prices. We stand behind our work, and provide a satisfaction guarantee. We strive to go the extra mile to complete the job according to your specifications. When you need professional power washing services, consider Viviane's Cleaning & Restoration Inc to remove to get the job done right. Call Viviane's Cleaning & Restoration Inc at (978) 216-2484, to receive a free estimate, and find out how reasonably priced our services are!